Dutch violinist and violist, Laura Veeze, has reached audiences on three continents as a soloist, recitalist, and chamber musician. She has held Principal Second Violin positions with the Radio Chamber Philharmonic in the Netherlands and with Symphony Nova Scotia in Canada. Currently, she is a member of the first violin section of the Edmonton Symphony and Principal Second Violin of the Alberta Baroque Ensemble. 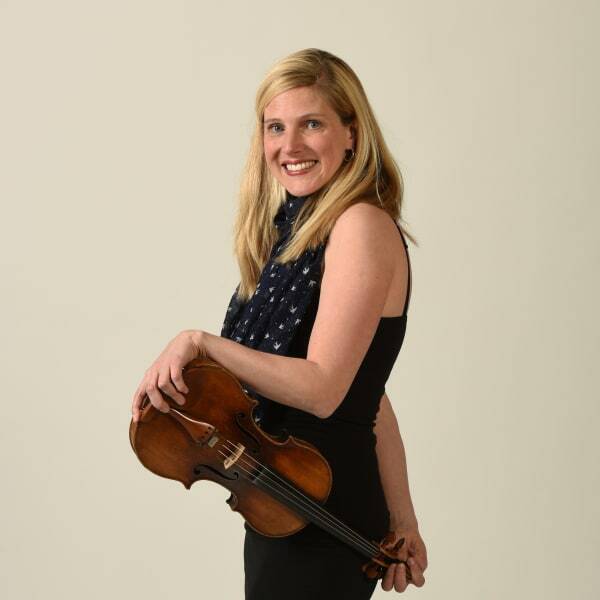 As a chamber musician, Ms. Veeze was a member of the piano trio Ensemble Pavone, the Blue Engine String Quartet in Nova Scotia, and is a frequent guest artist at festivals such as Scotia Festival, Musique Royale, New Music Edmonton, Early Music Alberta, and the Acadia Summer Strings Festival. She has collaborated with artists such as Jonathan Crow, Denise Djokic, Mark Fewer, and Robert Uchida. Laura also enjoys playing baroque violin and viola and is currently on faculty at the Alberta Conservatory. Ms. Veeze studied in Amsterdam and New York with Alexander Kerr and Sylvia Rosenberg. Laura is married to ESO concertmaster Robert Uchida. They enjoy the wonderful Edmonton community with their children, Marten and Noemi.